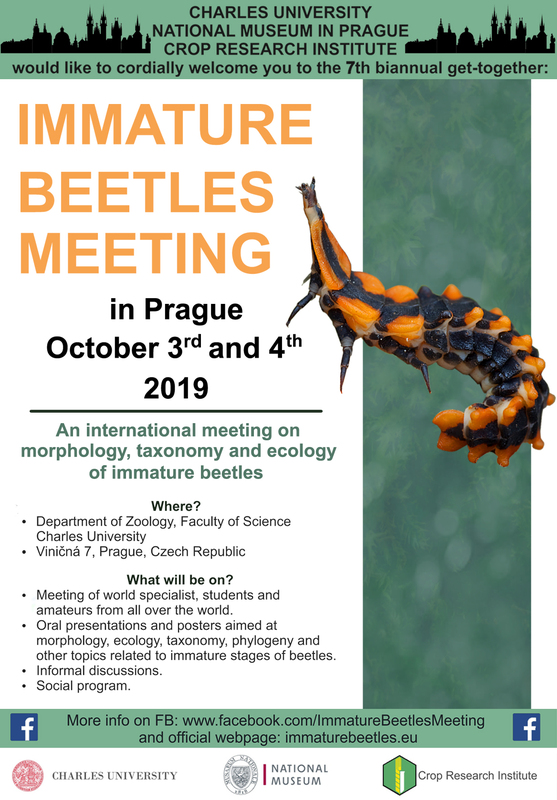 is an international meeting on morphology, taxonomy and ecology of immature beetles. October 3rd and 4th 2019. Directly predate the autumn Insect Fair as usual: 5th and 6th of October 2019. Department of Zoology, Faculty of Science, Charles University in Prague, Czech Republic. Street: Viničná 7, City: Prague. Closest subway station is I. P. PAVLOVA (red line C) and KARLOVO NÁMĚSTÍ (yellow line B). See google map for details. Closest tram station is ŠTĚPÁNSKÁ which is in the middle of the way between already mentioned subway stations (where are tram stations with same names as well). Meeting of world specialist, students and amateurs from all over the world. Oral presentations and posters aimed at morphology, ecology, taxonomy, phylogeny and other topics related to immature stages of beetles. Informal discussions & social program. 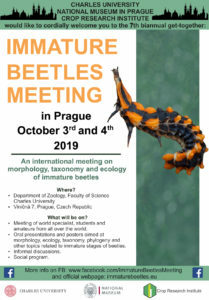 The Immature Beetles Meeting was first organized in 2007, and aimed as a meeting to facilitate the discussions of students working on beetle immature stages with more experienced colleagues. Since then, it is organized every second year, and became pretty international: 58 scientists from Europe, Asia, North America and South America participated in 2013, for example. The aim is still the same, i.e. to enable the communication among people working on immature stages of different beetle group, and to get younger students and newbies in contact with more experienced colleagues, enthusiastic amateurs etc. Accomodation, travel costs and any food outside the meeting room will be covered by attendants themselves. We will organize a common lunch on Thursday and Friday in a nearby restaurant (several kinds of “mid-day menu” will be available for a price about 7-8 euro including one drink). We will organize an evening pub on both days as well (again in nearby restaurants with similar pricing for dinner and one drink). See the markers in google map for addresses of restaurants for lunches and evening pubs. Length of presentation: 5-20 minutes + 5-10 minutes of discussion. We leave the decision of the length of the presentation on you – if you would like just to show a small interesting finding you did, go for shorter time, if you would like to present results of your larger project, feel free to use 20 minutes. Presentation of posters is possible, and posters will be presented during coffee breaks. Please prepare your poster at any size up to A0 in the “portrait” orientation. Abstracts for both oral presentations and posters are required. Abstracts will be available to all participants during the meeting and will be subsequently published in Acta Entomologica Musei Nationalis Pragae in October/November 2019. How to prepare an abstract: Abstracts are supposed to be a short summary (ideally one or two paragraphs) summarizing the contents of your talk/poster. Figures are not expected to be part of the abstracts. See the abstracts of the last IBM meeting and follow the same formatting when preparing your abstract.